Chef Mario Batali, known to fans as “Molto Mario” and “Mediterranean Mario” from his Food Network appearances, pays tribute to traditional Italian home cooking in a distinctly modern way. 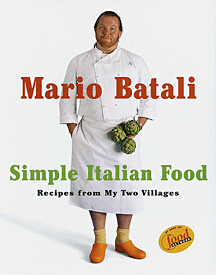 He presents more than 200 of his simple yet innovative recipes, arranged by course for fresh pastas, salads, ragus, grilled dishes—all of them inspired from two villages that have left their stamp on his cuisine: Borgo Capnne, the tiny hillside village in Northern Italy where he lived and cooked for several years, and, New York’s Greenwich Village, home to his restaurants Po and Babbo. His personal reminiscences, advice on dish preparation, and photographs on almost every page make this book as much fun to browse through as it is to cook with.